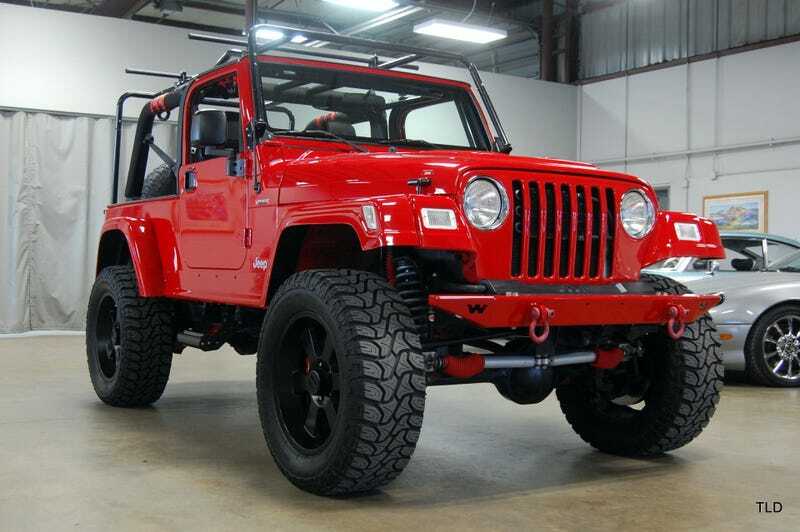 Could This Crazy Viper-Powered 2005 Jeep Wrangler Unlimited Possibly Snake $52,000? The longer wheelbase Wrangler LJ is a rare enough beast, but add to that the V10 of today’s Nice Price or Crack Pipe edition, and you’ve got yourself one hell of a Jeep. Let’s see if it comes with one hell of a price to boot. Hey! Happy 2018 everybody. It’s an exciting time to be alive, at the precipice of a new year. I’m sure you’re all feeling plump full of potential for growth and advancement, all engendered of course, by the social construct of an arbitrary delimiter on the calendar. We’re going to kickoff the new year with a quick look back at the one that just passed. Last Friday—and hence, last year—we wrapped things up with a mellow yellow 1990 Volkswagen Corrado. It seemed fitting to have a car with potential for disaster as our 2017 swan song seeing as it was a year in which so much went wrong—Equifax data breach, Astros World Series win (hey, I’m a Dodger fan), Tom Petty passing, etc.. Seeing as it was the end of the year and the start of a long weekend, many of you were feeling either magnanimous or at the very least phlegmatic to potential for future failure, and the Corrado came away with a solid 80-percent Nice Price win for its modest $1,500 asking. So, what are your New Year’s Resolutions? Mine are to clean out and organize my garage and to learn how to unicycle. One amazing goal that I hadn’t even considered is to Viper everything in sight. You remember the Viper don’t you? That was the monster Mopar with ten cylinders and a bad attitude. It was a car that could kill you without a second thought, but would never take the blame. It was just that cool. The Viper’s mega-donor mill—all 8.3-litres and 500+ horsepower worth also found its way into the Dodge Ram SRT10 2WD pickup truck. Both car and truck offered chancel to those who prayed only to the gods of torque and had nothing but scorn for the false prophets of fuel economy and parsimony. The Viper and the SRT10 edition of the Ram have gone the way of Elvis production wise, but that doesn’t mean that their engines don’t show up from time to time in the wildest of places. One of those places is this 2005 Jeep Wrangler Unlimited. It’s a one-off off-roader with a the 8.3-litre V10—late of an SRT10 truck—wedged in behind its iconic seven slot grille. The truck sports a ton of additional modifications to ensure the SRT10-sourced engine doesn’t turn the truck into a Jeep pretzel, and it all looks to be in terrific shape. You get a lot of go here with the show. although the engine might not be living up to its full potential here in its Jeep guise. The short engine bay seems to swallow the enormous mill without issue, but runs out of room for the intake. That has to do a couple of backwards bends which may constrict the amount of air offered to the ten thirsty cylinders. Whatever it makes, it’s going to be a lot, and the rest of the drivetrain is said to have been reinforced or replaced to accommodate. The automatic is a 48RE, and behind that lies a custom built transfer case from RockTrac. A Ford 9-inch axle does duty up front, while a Dana 60 holds up its end of the bargain in back. All of the work is said to have been done by Dakota Customs’ Dan Mckeag. There’s plenty of eye candy up top too. The Jeep rocks an eight-inch lift and rides on Pro Comp wheels wrapped in Micky Thompson Baja TZ meats. Warn bumpers and a Congo Cage spice thing up, and both the exterior and interior look to be without flaw. The truck is a soft-top, but comes with three locking compartments inside to keep your shite safe. The fact that it’s a fairly rare LJ with its 10-inches of extra wheelbase means both more room inside and a greater presence on the outside. That’s pretty helpful as, aside from some not so subtle badging, there’s no way to telegraph that this Jeep is rocking a perfect ten under its hood. A clear title and modest 22,500 mileage just sweeten the deal. We’ll have to see if a $52,000 price tag sours it. What do you think, is this custom and crazy Jeep worth that $52,000 asking? Or, does that make this Viper-equipped Wrangler total snake oil? eBay out of Chicago, IL, or go here if the ad disappears. H/T to @macintux on the Twitter for the hookup!